If you’re looking for a relaxing holiday retreat, our hotels in Yeovil are perfect for your country escape. At Hornsbury Mill, we offer a sophisticated blend of home comforts and contemporary designs with luxurious bedding and dining amenities. Whether you are celebrating a wedding in Somerset or are here on a holiday, our Hornsbury Mill Yeovil hotel is a perfect treat for you and all the family. Begin your country escape with our Somerset hotel. Hornsbury Mill celebrates its 19th-century features and architectural characteristics that are embedded in history. Our hotel has restored and is rebuilt around the old watermill; of which the cogs and workings of the mill are visible from our deluxe suites. When you come to our hotel in Yeovil, you can enjoy the peaceful Somerset countryside. During your stay with us, explore picturesque rural towns such as Taunton and Chard, which have an array of cosy pubs to enjoy an afternoon cream tea or a cheeky drink. Take a bus or drive to Exmoor National Park and immerse yourself in nature as you stroll through moorland lanes and enjoy the stunning views of Exmoor. Or, why not visit the Jurassic Coast and enjoy the spectacular sunset over the cliffs at Lyme Regis. Most recently famed for the hub of the Glastonbury Festival, Somerset is the place for a fun-packed holiday. If Glastonbury Festival wasn’t your thing, you can always explore Glastonbury Abbey and engross yourself in England’s past. Take a look at our list of local attractions to discover what else is on offer when you stay at our Somerset hotel. Enjoy the scenic landscape of our lake, fountain and four-acre garden that are an ideal romantic setting for weddings, or a couple’s retreat. Nature is right on your doorstep. An array of stunning garden flora and fauna has attracted swans, ducks and even peacocks to our beautiful gardens. Discover how we can make the wedding of your dreams come true by taking a look at our gallery. 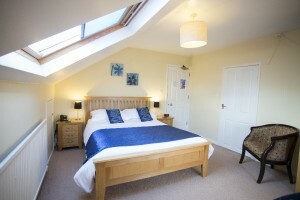 We have fabulous rooms at affordable prices when you choose to make your stay at Hornsbury Mill. All of the rooms keep to original wood beam designs that you would expect from a cottage or villa, and are thoroughly prepared for a spotless stay. All of our guest rooms have individual ensuites and luxurious facilities. Make your stay special by choosing our lavish Crown Wheel Suite. 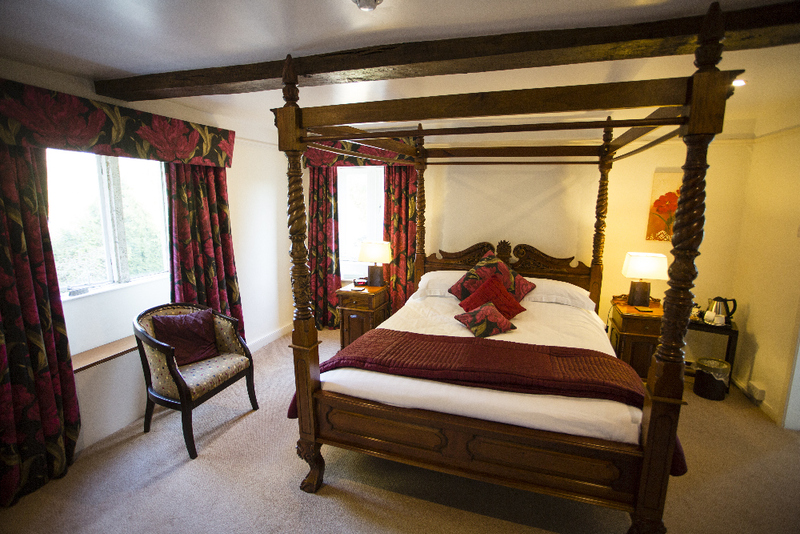 This suite offers a four poster bed in spacious living quarters with views of the beautiful gardens and the working of the watermill. Our restaurant and bar are praised for their homely feel. Enjoy a delicious locally-sourced meal under the glow of candlelight when you dine in our Wheelroom restaurant. At the bar, you can relax with a refreshing drink while taking in the spectacular views of the lake and fountain. Your dining experience doesn’t end with the evening meal. You will look forward to waking up to our breakfasts. With a choice of Continental or Full English cooked breakfasts, we know how to start your day off on the right track. Why choose our hotel based in Yeovil? Enjoy a weekend retreat at our hotel in Yeovil and contact one of our team at Hornsbury Mill today on 01460 63317 or send an email to info@hornsburymill.co.uk.